Reports have shown that most injuries and accidents occurred between the hours of 4 pm and 8 am. Therefore, the use of better lighting combined with other safety measures is important. 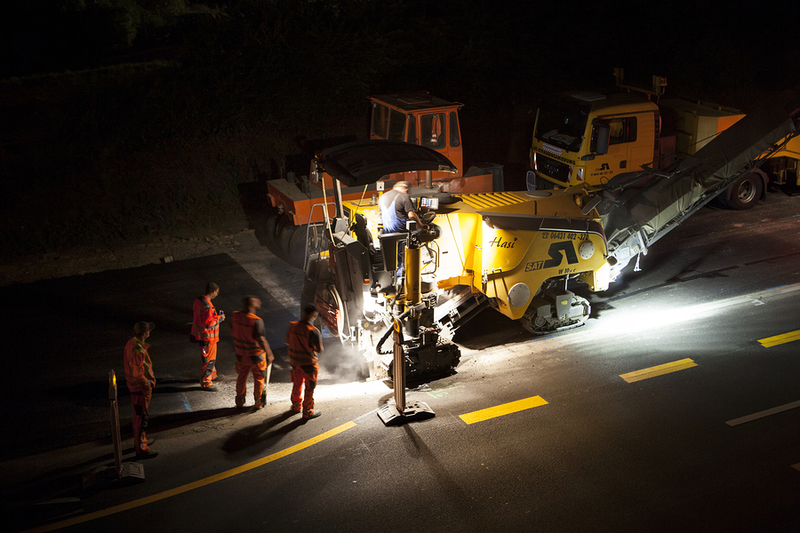 Protective barriers and active illumination clothing are also recommended to drastically improve the worker's visibility which can effectively keep them safer while working at night under these conditions. Always Stay Alert. When a driver is alert, and distractions are minimized or eliminated, then your full attention is on the road and what is going on around you. Avoid changing the radio station when going through these areas, stay off the phone, avoid eating, and keep your concentration on your driving and what matters the most. Keep Headlights On. It is important to make sure your headlights are on and in proper working condition to help illuminate the roadway. Pay Attention. Watch for all the signs, watch for brake lights ahead of you, and watch the traffic flowing around you, so you are better prepared to react if something were to happen. Merge Properly. If you see a lane closure ahead, give yourself ample time to merge. Traffic patterns in construction zones can change regularly, so it is important always to be alert. Refrain from Tailgating. Instead of tailgating people on the road, you should be maintaining a safe distance away from the vehicle in front of you at all times. Safely Change Lanes. Pay close attention when changing lanes. Watch for road closures and barricades and look for permitted traffic conditions. You should also always obey the posted speed limit because workers will be just a few feet away. Speeding fines are often doubled in these construction zones. Expect the Unexpected. Finally, always expect the unexpected. Workers, their vehicles, or other equipment may enter the roadway at times, and as a driver, you need to pay close attention to this and drive carefully and cautiously. You may also find abrupt stops, slower traffic, and unexpected lane changes as well. Above all, to keep yourself and others safe while driving through nighttime construction zones, you need to be patient. Several common accident types occur in these construction zones. Each of these zones has a few areas including the termination area, activity area, transition area, and advance warning area. The termination area allows traffic to continue normal operations and the activity area is where all the construction work is taking place. The transition area effectively moves the traffic out of its normal path and the advance warning area will tell the traffic what they can expect up ahead on the roadway. Rear end collisions and hitting fixed objects are two of the more common accidents occurring in these zones. To minimize the risk of nighttime accidents, you should slow down, drive smart, and follow all the safety tips as outlined above. However, if you have been involved in an accident and became injured. As a result, you can contact an experienced personal injury attorney to help walk you through the process following the accident.